In our new house (have I mentioned we are moving...like a million times...yeah, sorry about that) the bathroom that the kids will be sharing is T-I-N-Y. I will definitely miss their long bathroom with the double sink in this house. Today, as I cleaned out the toothpaste from the drawer they stash it in, I decided that when we move they are all getting their own tubes of toothpaste so I can finally know who the toothpaste over user is. 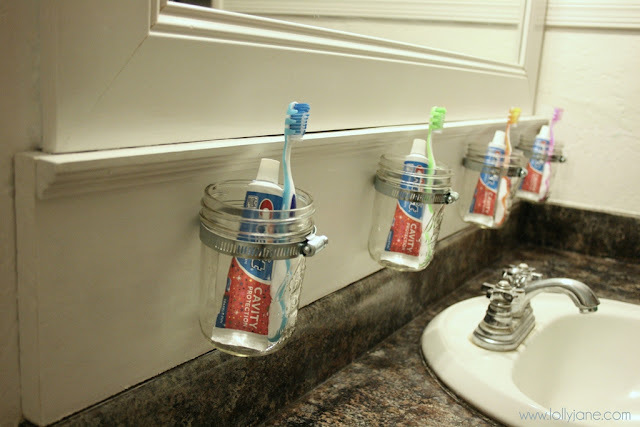 Then I stumbled across this fun idea for mason jar toothbrush holders that solves both the limited space and keep everyone's toothpaste separate problem! I love it!! Even if you don't have the toothpaste issue, you could store all sorts of fun stuff in these mason jars, even if it isn't in the bathroom. You can check out how to make your own DIY mason jar bathroom storage over at Lolly Jane. Hey girl!! THANKS for the shout out!-so happy you like it!